Thank you for purchasing YetiShare File Hosting Script. This welcome pack contains various tutorials and information that will aid you in using YetiShare. If you have any additional questions then feel free to create a ticket via our support system or via the email above. We have our own support portal that includes a support ticket system, knowledge base and forums, please register via our forum for full access. Note: You will need to be have a valid license & within your support period to access the ticketing system. You have lifetime access to the support forum and knowledge base included within your purchase. YetiShare is written in PHP5.6 and uses a MySQL5 database. YetiShare is a "Web Application" that must be installed on a Web Server. You must install YetiShare on a web host that supports PHP5.6, MySQL5 and Apache or Nginx. You may also install YetiShare on your personal computer by using one of the many options (i.e google WAMPserver or XAMPP), this is not covered in this document. The full system requirements can be found below. ​Linux. Recommended 64bit, at least VPS for full server config control. ​FTP module in PHP for remote server support. ​Curl module in PHP for remote upload and some plugins. ​Mycrypt module in PHP for secure password storage. We have a video tutorial showing all of the steps below. To view it please go to the installation tutorial page. 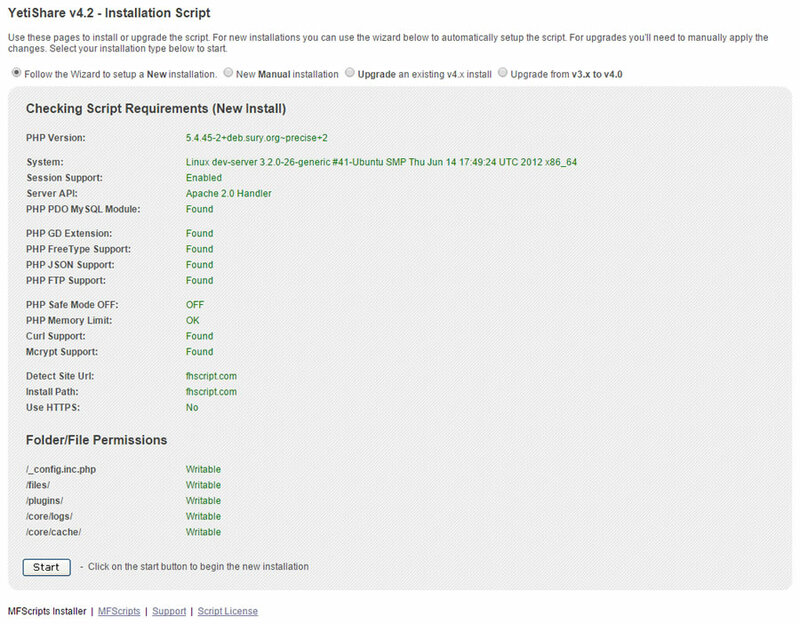 We've built an installation wizard into the script to make it really easily to get started. Extract the contents into a folder on your computer. Using a FTP client (such as FileZilla), upload the extracted contents to your web host. Note: You can install YetiShare as the main site, in a sub-folder on your existing web hosting or setup a new subdomain. While it's uploading you can create the database. Login via your web host control panel (such as cPanel) and create an empty database. Setup a new MySQL user and ensure you assign it to your new database with all privileges. Note your new MySQL username, database and password for later. Follow the steps shown in the install wizard. Enter your MySQL details when prompted and the database will be automatically installed. Setup the cron tasks, links provided within the installer, or here - https://support.mfscripts.com/public/kb_view/26/ every 5 minutes (more info below in the CRON section). If you have any issues with the installation, please see the troubleshooting section of this document. 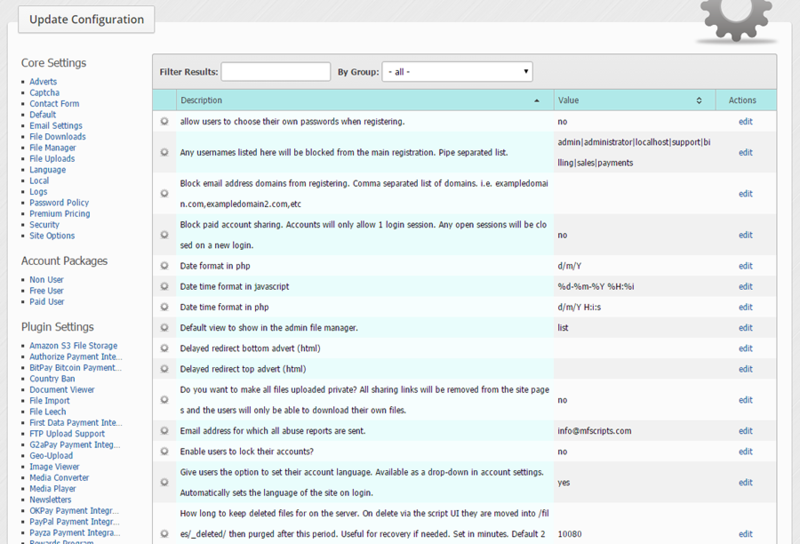 The cron tasks enable YetiShare to send emails, tidy data (and other tasks) in the background. Please ensure these are setup as they are required by the script. There are a number of ways to set these up. The best method is to use a Linux Cron style setup on the server itself. This will be the most reliable method. Although you can use one of the many free web cron services, these often only work once every 10-15 minutes, meaning that crons will take longer between runs. Type crontab -e in your linux command line. If you do not have access to the command line you might have access to the web hosting control panel that should allow this. Otherwise talk with your webhost. Upgrading is fairly straight forward. You can view the upgrade tutorial here, or use the following guide to upgrade your existing install to a new release. Backup your MySQL database, any /files/ and the _config.inc.php file. Backup any custom code or changes you have made (these may be overwritten). Unzip the newly downloaded zip file onto your local computer. Remove the local _config.inc.php file & the install/ folder. Upload the new files to your existing installation of YetiShare replacing all existing files. 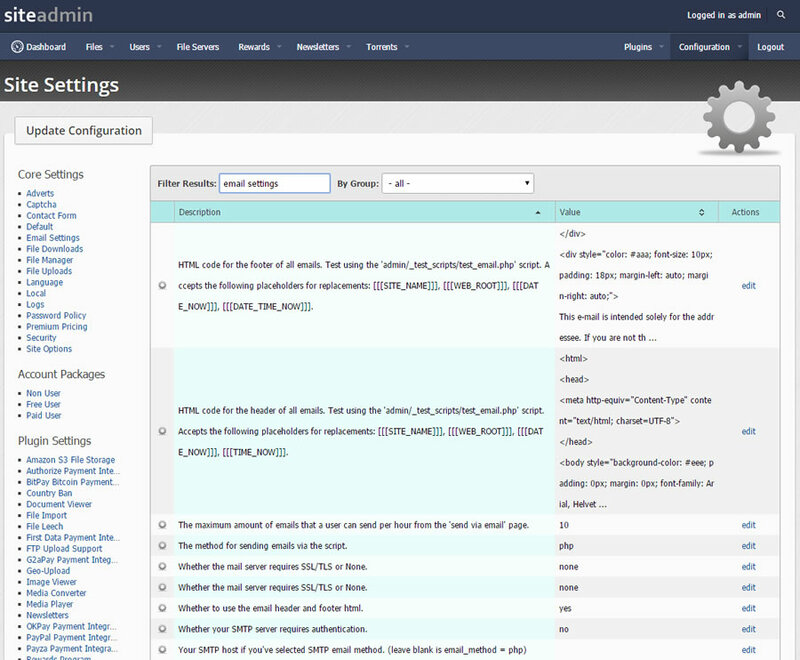 Within your hosting control panel, load phpMyAdmin and select your new database. In the right-hand section click on 'import'. Attach the the relevant sql patches from the directory `/install/resources/upgrade_sql_statements/` and submit the form. Choose the patches between your current script version number and the latest, ensuring you do them in version number order. If there are none, you can ignore this step. Done - Enjoy the upgrade! Login via the /admin url using your site admin credentials. On the top menu hover over 'Configuration', then click on 'Site Settings'. All the settings are categoried on the left-hand side. By clicking on any of these it will filter the view on the main part of the page. To edit, click 'edit' on any of the values. Any changes are immediately reflected on the site. YetiShare supports any number of languages. 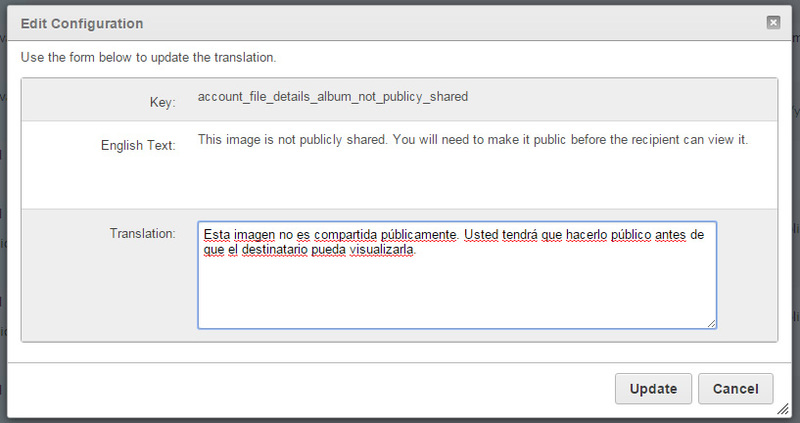 All the text content is routed through the translations module and can be translated. Via the Configuration menu, click Translations. Click the 'Add Language' button. Set the language name, Text Direction (only LTR) supported for now and the flag. Once added click on 'manage translations' and you'll see each text entry that you can edit. You can also export & import translations on the same screen if you'd prefer to edit them offline. To set as the main site language click the 'Default' checkbox on the 'Manage Languages' screen. Note: You may need to logout and back in to see the new language take affect. Load the 'languages' page within the admin area. Click 'manage translations' and search for the text you'd like to translation. Once you've found it, click 'edit'. Click 'update' once you're done. The translation will be immediately available on your site. The script structure can be seen below with notes next to each folder detailing it's purpose. You can create your own themes within YetiShare so future updates to the theme part of the script don't overwrite any custom changes. 1) Create a new directory named your theme in /themes/. Lowercase alphanumeric and underscores only. i.e. 4) Rename /themes/yourtheme/themeFlow.class.php to /themes/yourtheme/themeNewtheme.class.php, ensuring you make the first letter of the theme name uppercase and the rest lowercase. Your server configuration can have a significant impact on the performance of YetiShare. Below are some of the server settings we'd recommend using. It assumes you have at least a VPS server with root access and understand what you're doing! Restart Nginx after any changes. Restart your webserver to apply the changes. Save and restart MySQL. You may need to adjust this value depending on your traffic levels and server resources available. Use CloudFlare to reduce load, speed up website content to your users and protect against DOS attacks. After installing the script none of the html links are working and neither are the generated file download urls. ModRewrite hasn't been enabled within Apache. Contact your host to have it enabled. You haven't uploaded the .htaccess included in the root of the script download. Sometimes certain operating systems don't show files starting with a dot. Ensure it's appearing in the root of your installation. Anti Virus software has also been known to hide the .htaccess so ensure this is temporarily disabled. The Nginx rewrite rules haven't been added to your Nginx site config file. See the "___NGINX_RULES.txt" file in the root of the script download for the correct Nginx rules. 2) If you can't remember the email address or it's invalid, you can reset it directly via the database. - Login via your MySQL client such as phpMyAdmin. - Execute the following sql on your database, replace ADMIN_USER with your admin username (usually 'admin') and NEW_PASSWORD with your new password. When a user registers on the site they see the confirmation screen however they never receive an email with their password in it. 1) Test a registration yourself and ensure the email isn't being sent to a spam folder. If it is being spammed or if AOL/Hotmail accounts are not receiving emails, ensure you have SPF records setup for your domain. Your host or system admin can enable this. Set the options as shown above but replace with your own SMTP email settings. Your web host will be able to confirm these. Via FTP edit /admin/_test_scripts/test_email.php and replace the email address (you@youremail.com) with your own. Re-upload the file to your website. Login to your /admin/ area. An email will be attempted to the email address you entered. Any errors will be shown on screen. A common error is that the sending email address can not be used via that SMTP server so you may need to change the sending email address or ask your web host to allow it. Note: Sometimes not all debug messages are captured and outputted in the test_email.php script above. You can increase the debug level by temporarily editing the code. In coreFunctions.class.php find $mail->SMTPDebug = 1; and replace with $mail->SMTPDebug = 2; Save, reupload and test again for more detailed information. For new installs see ___INSTALLATION.txt in the script root. - Admins can now limit the hourly amount of emails sent by the send via email form by user. - Fixed issue with recipient email used on send via email template rather than senders email. - Fixed issue with zip file creation when using direct server storage. Version Notes: Major release with a lot of changes to the core code. For upgrades, upload the /install/ folder and see the Upgrade from v3.x to v4.0 option. For new installs upload the same folder and use the installer process. --- Preview of video/audio embedded into Flow file manager on file details popup. --- Capture of EXIF data on upload and displayed in the Flow theme image popup, in the file manager. --- Larger image preview added to Flow file manager on file details popup. --- Preview of document embedded into Flow file manager on file details popup. --- Link in admin, payment requests page to pay outpayment via PayPal. Auto-fills the amount, description, currency, users PayPal email address etc. - Right-click context menu on files in file manager & select all menu. Version Notes: Please see /offline/upgrade_file_diffs/ for the full list of changed files. This release is a minor release fixing a number of issues in the previous v3.5 release. Ensure you apply the database changes from /offline/upgrade_sql_statements/ when upgrading. Theres limited impact on templates this release, most is core code changes. For custom download pages, note additional text in admin area, download pages section for creating next page links. - Fixes to download process when using multiple download pages. Note additional text in admin area, download pages section for creating next page links. --- Added option to set hostname on username. Certain cPanel servers require login in the format username@domain.com. - Option to set direct file servers to produce download urls using the main site url. Final download is processed with file server. - Members area option to keep all file statistics private. Statistics urls will not work unless theyre logged into their account. --- Support for lights out when using JWPlayer. - Added forgot password link to main login page rather than just the login popup. - New add payment popup to manually log payments. Useful for manual upgrades, bank transfers, cash payments etc. - Added admin option to block paid account sharing. On login, itll clear sessions for any other users logged in with the same account. - On the uploader, added option to select folder before uploading (in options). Option pre-selected if upload prompted from your files. - Option to use a file server until its full, then use the next. File server priority must be set and until full chosen for the server selection method. --- Allowed processing of mp4s so theyre converted to streamable versions. - Many plugins, including the FTP plugin, have been updated for this release so they work with the new uploader code. If you use them, ensure youve updated your code to the latest version. You can do this by downloading the zip from our site and uploading the files to your plugin folder via FTP. - Minor change to wrap long file names within your files. - Allowed delayed redirect seconds to be zero so free users can be configured for direct downloads. - Site language chooser. Option in admin site settings to show or hide. - Database logging of which files result in paid upgrades. Available within the premium_order table. - Additional filters added to members area file listing (folder & status). Default file listing status is now active. - The right-hand your files widget now only displays non-account files by the same IP if the user isnt logged in. - Moved homepage benefits text into translations. - Added check for php ftp functions within admin test ftp page. - Fix on Admin Users & File Servers for the sorting of total space used and total files. - Removed database password from displaying if theres an error with database connectivity. - Added filter by server option on manage files in admin area. - Added filter by user option on manage files in admin area. - Added link to manage users to view user uploaded files. - Added total space used and total active files to manage users in admin area. - Fixed issue which meant the countdown wasnt displayed for free users when clicking on links in the your files section. - Missing unknown translation on stats pages. - Fixed possible XXS issues within login and registration forms. - Script initially released for purchase & download on MFScripts.com. This program was developed by MFScripts Ltd and is copyrighted. In no event shall the author or MFScripts Ltd be held liable for any damages whatsoever, including without limitation, damages for loss of business profits, business interruption, loss of business information, or any other loss arising from the use or inability to use the software. Your purchase of YetiShare allows you to install a SINGLE (one) copy of YetiShare on ONE domain. You may not resell, distribute or rent YetiShare. You can find our full terms and conditions here. A number of MIT, LGPL and other copyrighted libraries and resources have been used in this program. These copyrights remain the property of their owners. If we have missed anything please let us know! We've spent the past 4 year building YetiShare into what it is today, however there's still lots more we can do. If you have any comments on how we can improve the script further feel free to post on our RFCs via the MFScripts forum.